I said in a previous post that I would post some pictures of my parent’s new house in College Station. My parents bought 12+ acres of land in College Station (about 6 miles southwest from Kyle Field.) They bought the land in hopes to put a house on it so we could all stay there for Aggie football games(10 year season ticket holders)! My parents bought the land about 2+ years ago and long story short, they bought a double wide to put on the land and then found out they couldn’t put it on there because of the 100 year flood plain! So on to plan B! Plan B was to build a house on the land. The catch was it had to meet the flood zone criteria which meant to build a house on stilts of course! 🙂 My dad found a company that specializes in this and the house was just finished in late June. We have named it the ‘octaranch’ because it is shaped like an octagon, (and it is sitting on several 10 foot pillars!) How cool is that?!? 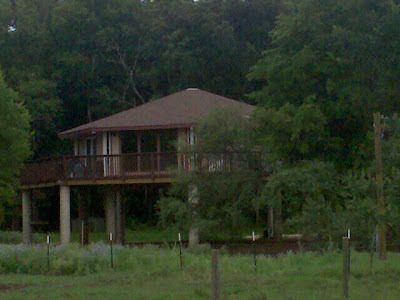 It really is beautiful with a wrap-around porch and a great view. The inside is so nice too! 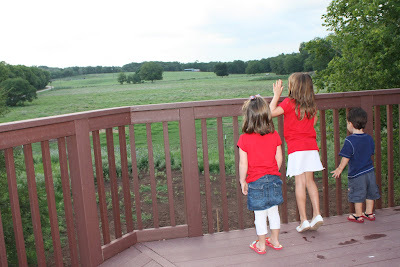 We look forward to having little getaways here or maybe a girls’ weekend or two! 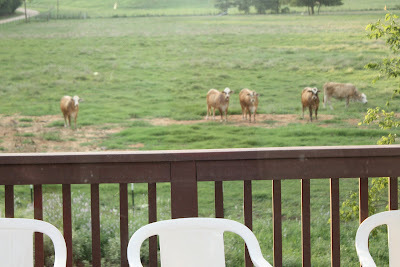 The cows on the land staring at us while we were eating breakfast!